For ages, Bora Bora tourists have extensively researched and planned their trips to one of the most popular and romantic destinations on The Islands of Tahiti in order to make the most of their time in the South Pacific. Then, during the course of their visit, they are struck by pleasant surprises and new discoveries that await them amongst the blue waters and coral gardens of the island. Even the most prepared tourists can learn something new about the unique and breathtaking island of Bora Bora. This island differentiates itself from the 117 other islands in The Islands of Tahiti thanks to these surprising facts. A honeymooner’s paradise, the island of Bora Bora is the ultimate setting for romance due largely to the iconic beauty of Mount Otemanu, which rises from the sea like an emerald jewel, encircled by gorgeous coral reefs and several white sand islets called motu. There are several motu surrounding Bora Bora including Motu Tapu, Motu Ahuna, Tevairoa, Motu Tane, Motu Mute, Motu Tufari, Motu Pitiaau, Sofitel Motu, Motu Toopua, and Toopuaiti. Most Bora Bora tourists arrive by air where they will catch their first view of Mount Otemanu and the many motu surrounding it, which are simply breathtaking. The legendary overwater bungalows of Bora Bora extend from each motu, offering unlimited views of Mount Otemanu from virtually everywhere on the island. Bora Bora can be reached by boat, helicopter, plane and cruise ship. The flight is only 50 minutes from Tahitior Moorea. Due to Bora Bora’s size, planes do not typically land on the island in the evenings. The port of Bora Bora is not large enough for a cruise ship to dock either, so tender boats ferry passengers between the ship and Vaitape wharf as an additional public transit option. While both public transportation and taxis are available, resorts and restaurants on Bora Bora are typically within walking distance, so visitors to the island should bring their most comfortable pair of flip-flops. From Bora Bora, you can also visit Tupai (also called Motu Iti), located about 10 miles north of Bora Bora, famous for its resemblance to a heart. There are no inhabitants on Tupai and no resorts, so your time on this dreamy island is limited to day visits only. 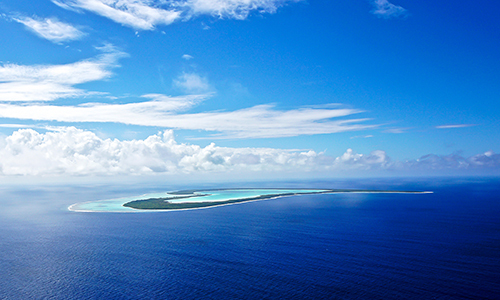 Best viewed by air, you can charter a seaplane or helicopter to fly over Tupai. Or, for those that would like to set foot on the isle of love, you may want to consider a boat charter. There are many options for this and more across each of the islands. Bora Bora is also known throughout the world for overwater bungalows, which you will find at most resorts on the island and surrounding motu. Bora Bora was among the first places in the world where you could find an overwater bungalow as they originated in The Islands of Tahiti in 1967 and their popularity has now spread throughout the world. The ideal place for romance, the overwater bungalow provides direct access to the lagoon from your own private deck where you can wake in the morning to watch the sunrise over Mount Otemanu from your bed. Many even allow you to watch the passing schools of fish through a glass window in the floor! The white sand beaches, turquoise lagoons, spectacular colored fish, and manta rays invite Bora Bora tourists to go scuba diving and snorkeling to explore the beauty below the surface. Diving is a very popular activity in Bora Bora and it has great dive sites for both beginners and advanced divers. Explore the outer reef or dive the pass to see a variety of marine life, including sharks, sea turtles, and many species of fish. 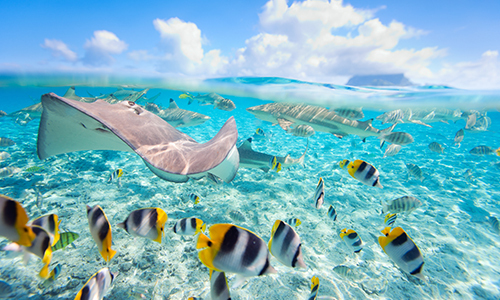 Bora Bora is especially well-known as a great spot to dive with graceful manta rays. Located in the Society Islands in the South Pacific Ocean, halfway between Australia and the USA, the exclusivity and aqua-centric nature of Bora Bora is what makes the island a dreamy paradise. And, because the island is smaller, Bora Bora tourists will enjoy a quiet and comfortable solitude while visiting, allowing visitors to truly recharge and relax in luxury without disruption. The island of Bora Bora is made up of three small villages, Anau, Faanui, and Vaitape. The administrative center of Bora Bora is on the settlement of Vaitape, which is also the largest of the villages on the island. Vaitape is a destination for visitors searching for signature souvenirs such as Tahitian black pearls, shell jewelry, colorful pāreu wraps, wooden handmade crafts, and scented soaps and oils. Vaitape is easily seen by taking a short walk around the public beaches of Bora Bora, and it is generally crowd-free, except when cruise ships and touring ships are in the area. This is where you will see an increase of tender boat traffic to the Vaitape wharf from the various cruise and touring ships. Bora Bora is home to the remnants of a once active volcano, which is in the very center of the island. The volcano rises to two peaks, Mount Pahia and Mount Otemanu. This, among a diverse landscape defined by tall mountain peaks, dense rainforests, and island Edens, offers Bora Bora visitors the best of several worlds, unlike anywhere else on the planet. The magnificent vistas from the dormant volcano open to spectacular views of the coral reef, soft sandy beaches, and impressive mountain terrain. While Bora Bora is one of the best places in the world to relax and unwind, it is by no means lacking in adventure. The distinct geography on the island of Bora Bora invites visitors to participate in one-of-a-kind experiences, such as scuba diving, reef discovery, safaris, hiking, fishing, and even parasailing and seaplane charters. These experiences, especially those that offer a birds-eye view, allow visitors the awe-inspiring opportunity to explore some of the most beautiful lagoons in the Society Islands, see hundreds of different species of marine life, and soak in sights that simply cannot be experienced from the lounge chair at your resort. How Did Bora Bora Get its Name? The island of Bora Bora was originally called “Pora pora mai te pora,” meaning “created by the gods” in Tahitian. It was often abbreviated as “Pora Pora” meaning “first born.” In the 13-letter Tahitian alphabet, there is no “b.” But, to settlers and explorers visiting the islands for the first time, the name of the island was quickly heard and misinterpreted as “Bola Bola” or “Bora Bora,” and it’s why we refer to the island as Bora Bora today. Explorer James Cook spotted Bora Bora in 1769 on his first voyage to French Polynesia, and a London Missionary Society (LMS) base was established on the island in 1820. Bora Bora’s rich history doesn’t stop there. During World War II, a U.S. supply base was established on Bora Bora in direct response to the bombing of Pearl Harbor in 1941. From early 1942 to mid-1946, during what is known now as “Operation Bobcat,” the island of Bora Bora was transformed into a base where more than 6,000 men were stationed. During Operation Bobcat, the island acted as an oil depot, an airstrip (Motu Mute), seaplane base, and defensive fortifications center. Until Tahiti-Faa’a International Airport opened in 1961 on the island of Tahiti, Motu Mute was French Polynesia’s only international airport. Today, the runway on Motu Mute is a reminder of those war days. Eight massive, seven-inch, naval cannons were installed around the island during the war. Today, all but one is still in place. Bora Bora is popular the world over, so it’s no surprise the island attracts movie stars and film directors looking to showcase their work against the world’s most gorgeous backdrop. “Couples Retreat,” the 2009 romantic comedy starring Vince Vaughn and Kristen Bell, was filmed at the St. Regis Resort in Bora Bora, and “The Bachelorette” season finale starring Ali Fedotowsky was filmed at the Conrad Bora Bora Nui, the same place “Keeping Up with the Kardashians” shot three episodes of its sixth season while on the island. The native art and culture of Bora Bora, as well as the unconditional love and reverence locals have for their rich history and legendary customs, makes the island a unique destination. Bora Bora is a tropical paradise that many long to visit. The culture of Bora Bora is easily adopted by Bora Bora tourists. As one of the 118 islands of Tahiti, its allure comes from both its unmatched beauty of the landscape and the richness of Tahitian culture. The people of Bora Bora embrace visitors with the aromatic tiare leis, as well as welcome them with warm smiles and traditional music and dance. Your visit will be greatly enhanced by learning about Tahitian and French Polynesian Culture during your visit. The essence of Bora Bora seduces all who visit and the memory of their time visited there remains like a beautiful dream. Bora Bora tourists will quickly learn that the language and experiences of French Polynesia are captured in the region’s arts and crafts, dance, and tattoos, which tell the history of the locals’ ancestry. Bora Bora culture was suppressed for decades, almost to the point of total disappearance, and has come back more vibrant and alive than anyone could have imagined. Yearly events like the Heiva i Fete showcase the value placed on tattoos, dance, and art. The word tatau (tattoo) originated in The Islands of Tahiti, and each tattoo has meaning that tells the story of each Tahitian’s personal history and ancestry. This aspect of Tahitian life, combined with orchestras that use percussion instruments such as the to’ere, the fa’alete, and the pahu as well as guitars and ukuleles , were introduced to Bora Bora, and helped shape the culture, dance, and relationships in Bora Bora and The Islands of Tahiti as a whole. The style of music that developed on the islands has hints of country western mixed with classic South Pacific island style. The art of dance on Bora Bora is still alive and plays a big part in island festivities throughout the year, telling the story of their culture and history much like the art that lives on their skin. Tattooing was widely practiced and found throughout French Polynesia with the exception of the southern Austral Islands and the eastern Tuamotu Islands. It was in the Marquesas Islands that the art of tattooing reached its peak of development. Increasing its richness and complexity through the use of motifs, the art quickly reached Bora Bora and rapidly spread its artistic influence throughout the rest of the islands. Today, visitors from all over the world travel to The Islands of Tahiti to participate in the sacred art of tattooing with a Polynesian tattoo artist. Not interested in getting a tattoo when visiting Bora Bora? There are other ways in which Bora Bora will stay with you. During your visit, you will experience something intangible that will find its way home with you as well. It’s a feeling the islanders call Mana, and it is the spiritual force at the center of the Polynesian belief system. Mana is a concept that is difficult to describe, though it can be profoundly experienced throughout The Islands of Tahiti. Mana is an omnipresent mystery that connects all living things and those that came before, it can be channeled to increase aspects such as strength, wisdom, or peace, and encompasses the dualities of life. To truly experience Mana, Bora Bora tourists must let go and let themselves become completely immersed in all French Polynesia has to offer them. Take part in the culture and join in by dancing, singing and exploring. Peaceful moments spent enjoying the nature on the island and encounters with wildlife such as rays and sea turtles are also wonderful ways to experience the embrace of Mana. From the traditions of art and tatau to music and dance, all aspects of Tahitian life and culture give voice to their Mana and is a potent part of the visitor experience in Bora Bora and The Islands of Tahiti. It is easy to see why Bora Bora is world-renowned for romance and relaxation but now you see it is also so much more! 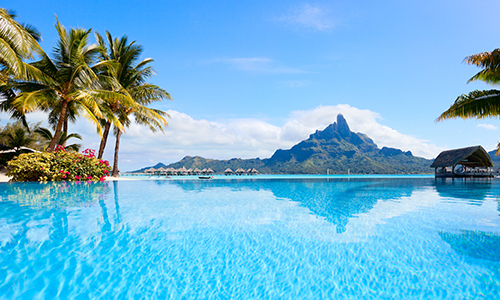 Explore Bora Bora and The Islands of Tahiti.